Two-sided lighted table-top mirror for professional makeup. 6 lighting points and electrical socket on each side. Classic line, selected materials and I-light pro lights make it ideal to furnish high-level corner dedicated to make-up and beauty in stores or makeup schools.The structure is made in first choice dried lacquered beechwood. Handcrafted in Italy. Special light engineered for makeup: from the distance between light points to the uniformity of the light emission, paying absolute care and attention to selecting the right colour temperature of 4200 Kelvin. Each mirror can be lit independently. 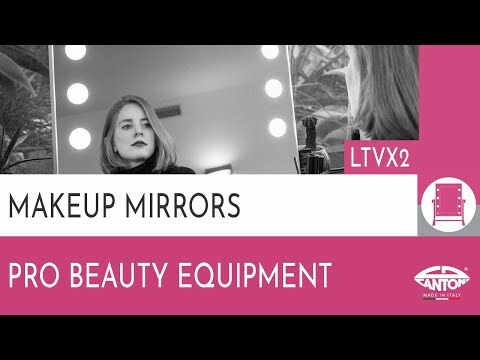 This table-top makeup mirror is equipped with I-Light system, the perfect lighting for makeup professionals. Perfect lighting for makeup works: the light sources do not generate heat and do not need to be removed or cooled. What on first glance may appear to be bulbs, are actually lenses, made of highly refractive, shatterproof material capable of diffusing and screening the light in a perfectly uniform manner. PRINT OF YOUR LOGO: If you want the product you've chosen to be printed with your logo, select the appropriate option. After completing your order, please send us an email with attached the file for printing at cantonionline@cantonionline.com . It will be accepted only in vector format files in one path. Print output, by default, in white color. If you need the print in other colors, please insert a note in the order.